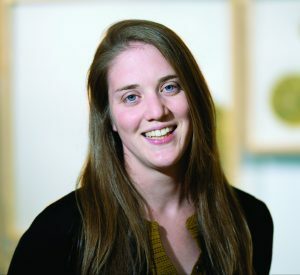 PORTLAND, Maine – Maine College of Art (MECA) has appointed Nikki Rayburn ’11 Interim Director of Exhibitions at MECA, a position which directs both the Institute of Contemporary Art (ICA) at MECA and the Bob Crewe Gallery. The announcement was made by Ian Anderson, Vice President of Academic Affairs and Dean of the College. As MECA’s former Exhibitions Coordinator, Rayburn worked closely with the previous Director, Erin Hutton ’98, whose leadership helped expand the vision and scope of MECA’s exhibitions over the last five years. Rayburn is an adjunct Assistant Professor in the Woodworking and Furniture Design program at MECA. She joined MECA as an adjunct faculty member and studio technician for Woodworking & Furniture Design in 2013, after earning her MFA in Craft/Material Studies from Virginia Commonwealth University. A MECA alumna of the Woodworking and Furniture Design program, Rayburn’s work, which has been shown extensively in the U.S., embraces traditional craft techniques. She has trained in woodworking, textiles, and basketry construction, and her work aims to honor the laborious and physical nature of one’s making practice.